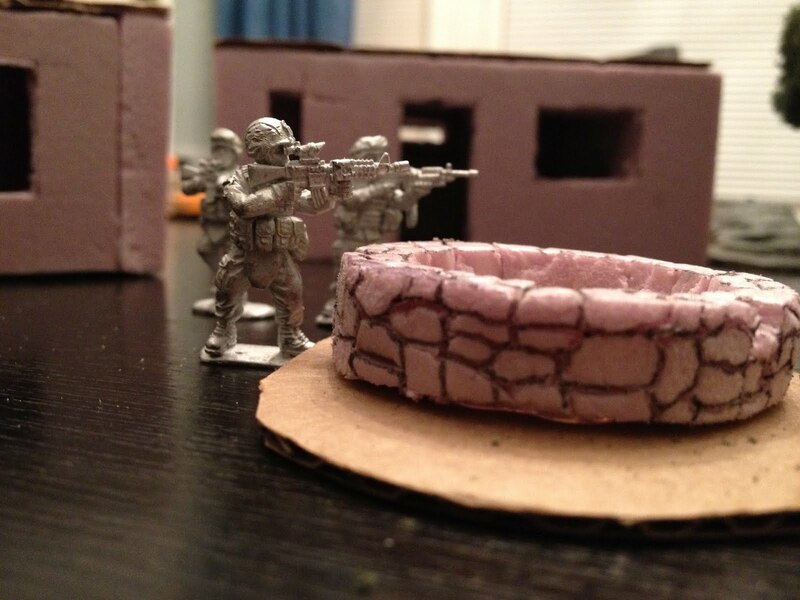 Wargaming requires terrain. 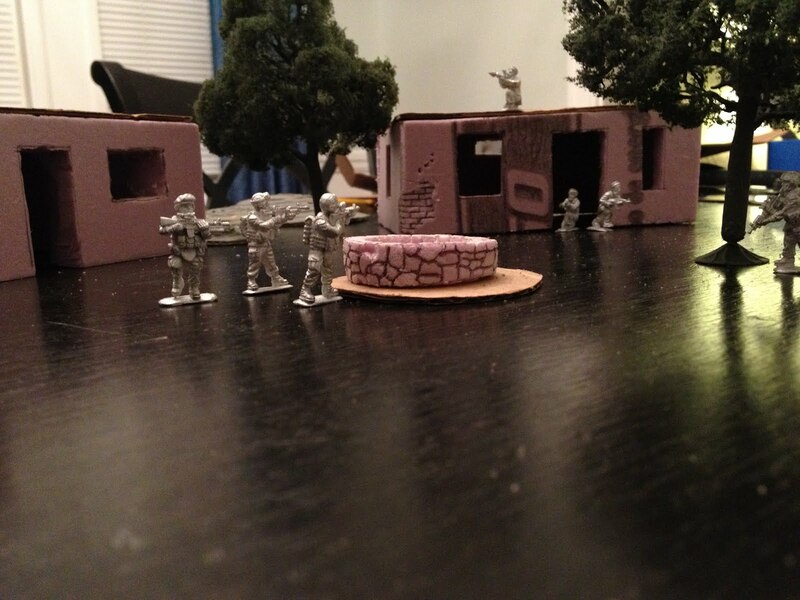 If your table top battles are to employ flanking maneuvers, gaining the high ground, obtaining cover, etc...you'll need to represent this on the battle field. Representation is a key word here. you could place a piece of paper down on the table, call it a building, and imagine how it would impact line-of-site. I myself have stacked a few volumes of Encyclopedia Britannica (R.I.P. physical copies) to convey bluffs and buildings. But let's face it. You aren't driven in the hobby to have your armies fight for dominance of an reference library encampment and run for cover behind a shoe box. You want good model terrain. You want your battles to look like the ones you see photographed in the rule book. You want your battles to offer up great photo ops where your models accurately depict soliders digging in to their position and taking advantage of cover. In my past dabbles into the hobby, I never got around to terrain, and I think not having it was a contributor to not keeping up with it. So back in February, as I started to get into Force on Force, I wanted to make sure I had a jumpstart on terrain, even before I'd received my copy of the rule book or the miniature soldiers who'd be doing battle. In the past I had toyed with cutting cardboard boxes into concentric shapes, resulting in a topographical hill. This seems like a good idea because you'll get flat areas for your miniatures to stand and steep areas where a miniature can't stand. Simple enough. So that's what I started with. Wasn't sure how I was going to cover them or get them past the cardboard glued on cardboard stage, but that's when I discovered a very helpful, if not a little crazy, Canadian on YouTube, TheKamloopian. This guy does incredible stuff. I was very inspired by his videos. He has hundreds of them. One drawback was that he didn't have a great way of tying his videos together so following one project from start to finish was very difficult. However, that being the case, I started seeing a little bit of everything. "Here's the base material for buildings, eh" (pink foam insulation from Home Depot). "Make sure you cut your windows smaller, eh". "Don't spray paint foam, eh, or it will melt." "Here's how to do catwalks, fences, shingles, brickwork..." And goop. Goop is key. And that's where I started as step two to my hills. Goop is a mixture of White Glue (or wood glue, but for me that made it too rubbery), Water, Caulk, and Plaster (I'm using Durham's Putty). I never got my Goop to be just like TheKamloopian's, but I got it to work for my needs. I slathered it onto my cardboard hills (along with a ridiculously conservative sprinkle of modeling sand) and let it dry over night. Then I sprayed them with Gray Primer. I should note, that I now know better. No need for the modeling sand because I ultimately heavily coated them with real sand. That goes for the primer too...completely unneeded. At the time though, I still wasn't sure how I was going to do the landscape and was basing my experiments on the videos I'd seen on how to make buildings. Here's what they looked like at that stage, however. I used one of my oldest Warhammer 40K miniatures (I think it may actually be the first miniature I ever painted!) for some scale testing and I thought that they turned out pretty good fo some dried up afghan riverbeds or small rocky hills to put near buildings or on the outskirts of villages. Next up, my first crack at a building. I'm not going to lie, the rudimentary architecture for an Afghan village were a draw to modern wargaming. The Space Gothic vibe of Warhammer, while awesome, appears difficult. World War 2 European architecture, also difficult. 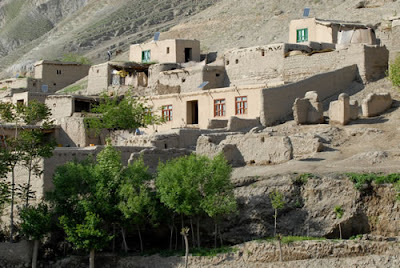 Adobe huts? One color? seems like a good place to start. 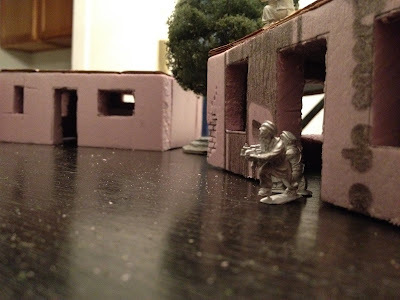 So I started cutting my teeth on an Afghan village, though now, my ambitions are to create something more along the lines of Tehran or Bagdad for the next table project. 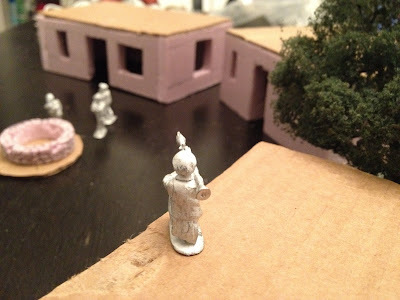 I got a half sheet of pink foam insulation from Home Depot and started cutting away; creating my first two buildings. For the first building (pictured) I used the full thickness (I think over an inch) of the pink foam...ultimately not what I'd recommend. It makes cutting the doors and windows very difficult and when miniatures are placed near it in the game, the thickness of the window frames will stand out. So for the second building, after my firs cuts, I knifed down the middle of the foam, halving the thickness. Bingo. not only does it make the windows and doors significantly easer (and better looking) but you double your materials! I also wanted to try my hand at brick/stone work. I know that I want some of the buildings to have wear and tear with some chipped facade and exposed brick so I did a proof-of-concept by making a small well. I'll tell you now that the well was never completed, a casualty of some failed attempts with Goop. But it looked great when still in the rough stages so I'm sure I'll revisit the idea and make a well at some point. It also gave me the confidence to immediately attempt some brick work on the second building. The next day my miniatures arrived along with two trees I'd ordered. The miniatures are very cool. I had decided to go with the 28mm "Heroic" scale miniatures. I'm visually attracted to wargaming, potentially more so than from a strategic game stand point, so I wanted to go with the size that would give me the most detail, while still small enough to amass a good sized collection and in the future have larger sized skirmishes. I decided to take my first look at how they'd play out with my new buildings.